The 2010 Games in Vancouver will undoubtedly be the last chance for biathlon fans to catch Germany's diminutive veteran Andrea Henkel in top form as the Salt Lake double gold medallist hunts one last Olympic title. She'll be 32-years-old as the Games get underway, 20 years after discovering the discipline of biathlon at the Grossbreitenback club where she stepped out of her elder sister Manuela's shadow, who was a cross-country skier. Her chief rivals at Vancouver will make her quest for gold all the more formidable as the ferociously competitive duo of Sweden's Helena Jonsson and Germany's multiple champion Kati Willhelm are the women barring her path. The six-time world champion bagged her first medals on the junior circuit with world titles in 1996 and 1997, before being struck down by an illness in 1998 which interrupted her career and necessitated a courageous comeback. Back from the brink, she came 14th overall in her first World Cup season with the seniors. Despite strong competition within a German team that featured her sister Manuela, Uschi Disl and Katrin Apel, she moved up to fifth overall in the 2000 season during which she won her first two races in Slovakia and Italy. Her finest hour duly came at the 2002 Games in Salt Lake City where she raced to the 15km individual Olympic gold leading home Norwegian Liv-Grete Skeljbreid and Sweden's Magdalena Forsberg. It was only the second win for a German woman in this event, following the success of Antje Misersky at Albertville in 1992. To cap a joyous occasion in Utah, she won a second gold just days later, as Germany lifted the relay crown in a team that included Disl, Apel and Kati Wilhelm. 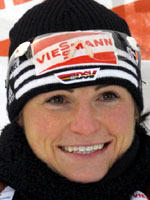 After her double Olympic success at the Salt Lake City games, the German experienced a dip in form but the 27-year-old is back on track after skating to the podium on two occasions at the 2005 world championships in Hochfilzen. The 2006 Games were also slightly disappointing as a silver in the relay was all she could garner. However, she was to storm to the 2006-07 World Cup overall title and claimed two world titles in the mass start and relay. And while 2008 also brought a rich harvest with gold medals in the sprint, pursuit and relay, 2009 belonged to Willhelm and Jonsson. The anecdotes will report that Henkel was barred from defending her 2008 title after inadvertently firing a shot during practice! The trigger-happy German soldier can now set her sights on more medals at Vancouver where stray shots won't be the only worry for her rivals.